Patient in his mid 40s came to our office for implant crown on his front tooth. He had a history of Implant crown that repetitively came loose. The patient finally was referred to our office by his general dentist. 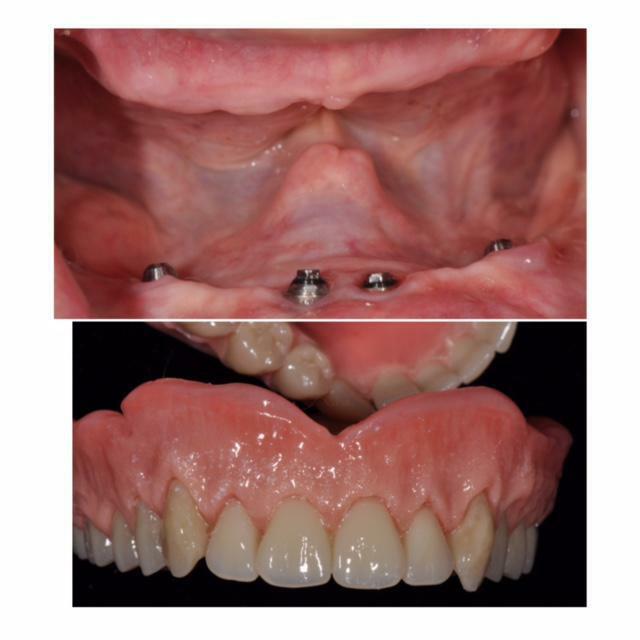 Screw retained PFM implant restoration was fabricated by Dr. Mussie Sibhatu and patient was very pleased with the result. 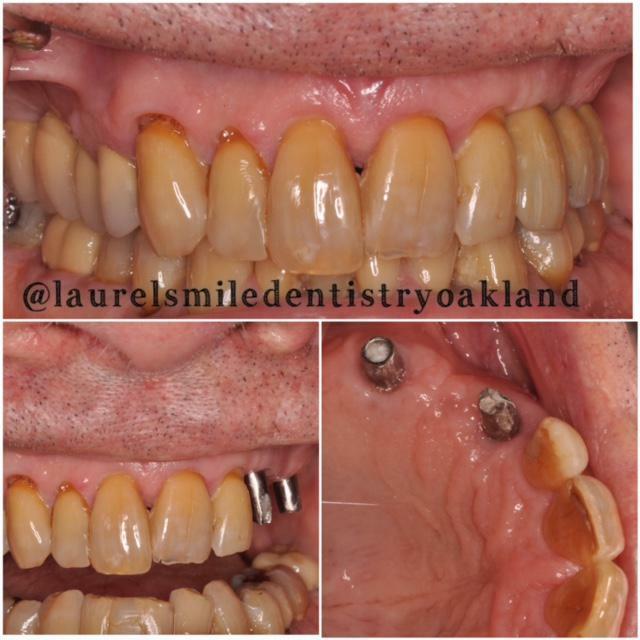 Patient on his late 70s was referred to Laurel smile Dentistry from Bayside Oral and Maxillofacial Surgery to restore the implant bridge on the upper left. 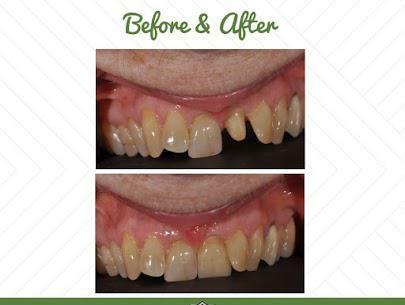 Patient had a history of a natural bridge that failed and he did not want to wear any removable partial dentures.Two implant supported fixed bridg was fabricated by Dr. Mussie Sibhatu and Patient was very pleased with the color match and fit of his implant bridge. Patient presented to Laurel Smile Dentistry with mobile and failing lower teeth. Extraction and implant placement was done at Bayside Oral and Maxillofacial Surgery. Dr. Mussie Sibhatu desinged and fabricated five implant supported fixed restoration with individual crowns cemented on a framework. The patient is very pleased with her reuslt and she compared the comfort and feel of her new restoration to her natural teeth. Eighty year old patient has suffered from ill-fitting lower dentures and unaesthetic upper dentures. 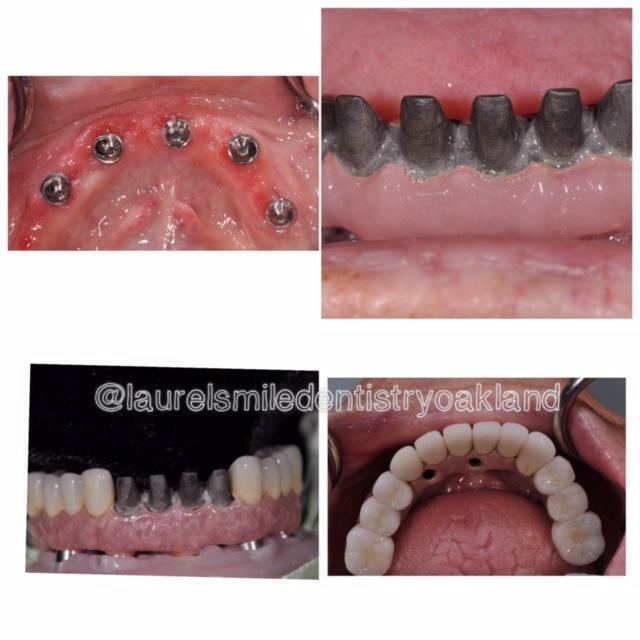 Four lower implants were placed by Bayside Oral and Maxillofacial Surgery and full upper cosmetic dentures and lower implant bar retained over denture was fabricated at laurel smile dentistry by Dr. Mussie Sibhatu. Patient is very pleased with the result and he reported that he can chew and taste his food better. 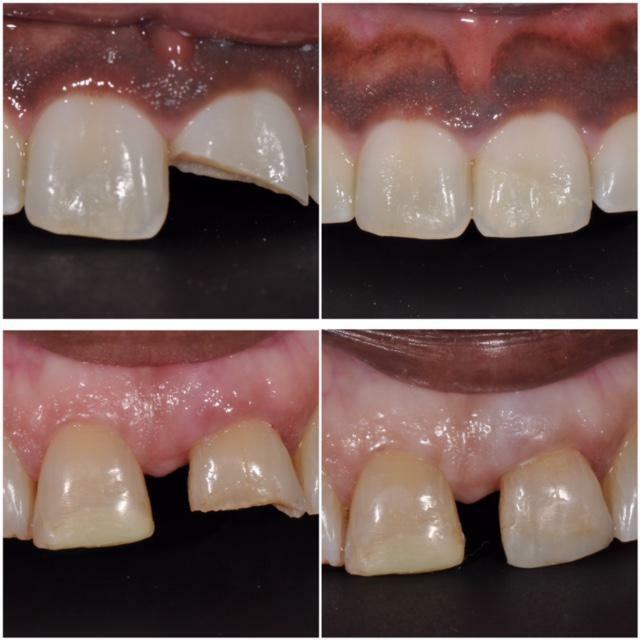 Composite boding is a great way to restore chipped teeth when the patients cannot afford a crown or veneer. A 15 and 68 year old patients came to our office after traumatic accidebt on one of their front teeth. Cosmetic bonding with resin filling was performed and patient left Laurel Smile Dentistry very pleased. Veneers are great choice to replace discolored or chipped teeth. 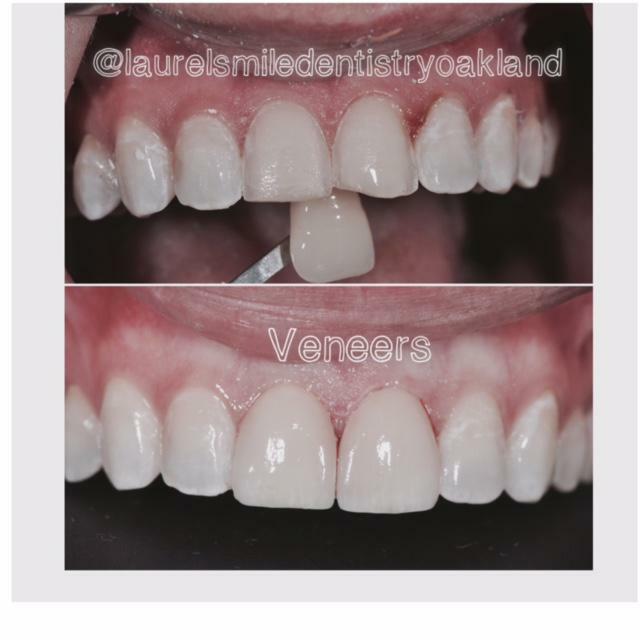 A 24 years old female patient presented to Laurel Smile Dentistry for veneers on her front teeth. She had old discolored bonded resin in her two fron teeth. She was very uncomfortable with her smile. Two laminate veneers were fabricated and cemented to her front teeth by Dr. Sibhatu. Patient left our office pleased. Patient did not like the metal showing on her front teeth. All ceramic crowns were fabricated to mask the staininig and darkness on her teeth by Dr. Mussie Sibhatu at Laurel smile Dentistry. Patient like her new smile and left our office pleased. Patient presented to our office because she fractured an old crown that she had for several years. The patient reported that she never like her previous crown. The color match and shape was way off. 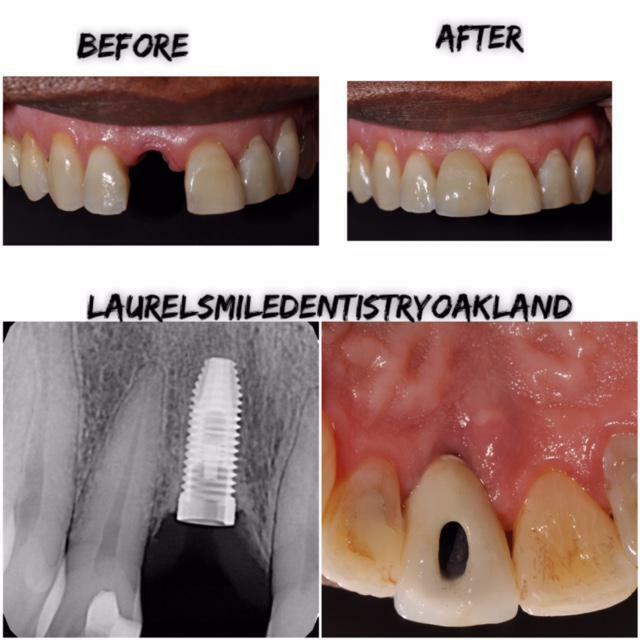 Dr. Mussie Sibhatu @laurelsmiledentistryoakland fabricated emax layered crown; custom shade selection by our lab in the facility was done for shade match to the adjacent tooth.